Tony Dangerfield, who was bass player with a brummie trio called Gulliver's Travellers, had turned down the chance to replace Ricky Brown in the Savages at a first time as well as the offer from Brian Epstein to join The Big Three. Then a fortnight later, when they were on in Rugby with The Fortunes and The Farinas featuring Roger Chapman, Johnny Bedder, their guitar player, announced him that he and drummer Neil Norman had accepted the job in The Savages for him. Then Dangerfield joined two days into a five-week-tour out of London during January 1964. He prided himself that the Savages could blow the current chart toppers like the Searchers off the stage. John Gilbey who was formerly with John Mayall's Bluesbreakers - just before Bernie Watson - and The New Premiers alongside Ronnie Harwood was the official replacement for Stuart Taylor on guitar. While The Savages were down to do a single without Sutch, Joe Meek signed Tony Dangerfield as a solo artist. Meek tried grooming him for stardom a la Heinz, the former bass player with The Tornados who now was touring all over the country with his own backing band, The Wild Boys featuring Ritchie Blackmore. As he had dyed blonde hair, Meek made him dye it black so as not to clash with Heinz. Joe Meek let him recruit his own backing band. Tony went back to the Midlands to recruit his former band Gulliver's Travellers, whom Meek promptly re-named The Thrills. Tony also used "Cheap Thrills" as an alternative nickname. This band also included pianist Mike Benson and bassist Ron "The Elf" Blackie. The result single, released in September 1964 by Pye Records (7N 15695), presented two very contrasting sides. The A-side "I've Seen Such Things" was a soulful ballad penned by Manfred Mann's vocalist Paul Jones and bass player Tom McGuinness whereas the reverse-side "She's Too Way Out", a song already recorded by Cliff Bennet & The Rebel Rousers, a heads-down rocker, featuring a pair of scorching guitar solos from Johnny Bedder the former guitarist Gulliver's Travellers. It did'nt feature Ritchie Blackmore as rumoured. After this record, Tony Dangerfield carried his Thrills throughout the land for a promotion tour and then to Germany where they shared a venue with Ted "Kingsize" Taylor for a month. Tony Marsh went on to join the Tornados prior to returning to Neil Christian & The Crusaders. John Gilbey then decided to finish with professional band work permanently and became a male nurse. By this time, Jeff Beck was lead guitarist with a Blues Combo called the Tridents run by Lucas Brothers. 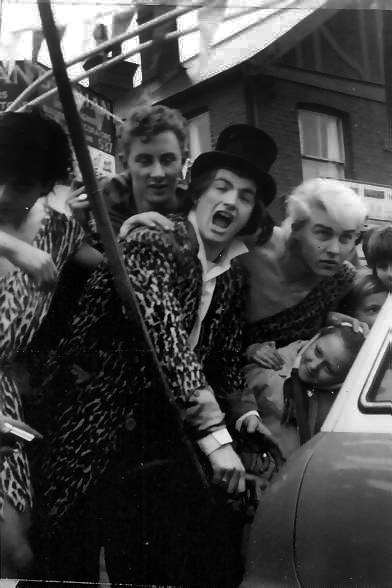 It have been said that when Screaming Lord Sutch performed south London R'n'B Clubs such as The EEL Pie Island he was backed by Jeff and the Tridents. 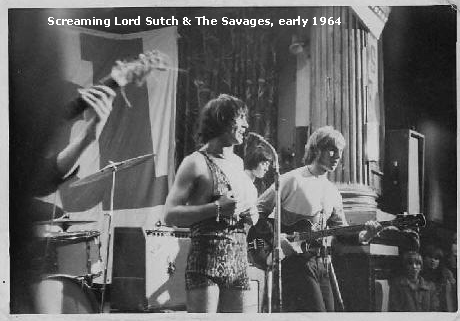 Lord Sutch often claimed that Jeff Beck filled in as a member of The Savages in 1964. Jeff Beck would have earned a reputation by supporting Sutch, which helped him land the job as the Yardbirds' lead guitarist following the departure of Eric Clapton in early 1965. NICE STORY ? ( Tony Dangerfield ) But a little loose ? Would make a good fairy story ? Tony was never offered a job by Epstein. The Thrills were Savages - I was there the day Tony and the Savages recorded (Iv'e seen sutch things) at Joe Meeks studio. from left Tony Marsh - Colin Dale - David Sutch - and Tony Dangerfield. Its a photo of a Garage we opened in High Wycombe in 1963 - that's the year Tony Dangerfield joined David Sutch ( not 1964 ) we all got paid for having a larf. It would have been nice if you had asked my permission to use it ! ( but not to worry )If you had spoken to me I could have helped you to get some of your facts straight.